Low Density Full Tested. new arrival. We will try our best to replay in 24hours! DDR1 400MHz (PC1-3200). AMD phenom N830 HMN830DCR32GM Socket S1 (S1g4) 2.1G processor for laptop. For NANYA 32GB 8x4GB 2Rx4 PC2-5300F DDR2-667MHz 240pin ECC FB-DIMM Server RAM. new arrival. We will try our best to replay in 24hours! For Samsung Galaxy A5 2017 A520 A520f SM-A520F A520F/DS LCD Display Touch Screen. Low Density Full Tested. AMOLED LCD For Samsung Galaxy J7 Pro 2017 J730 Display touch Digitizer assembly. new For LG K10TV 2016 Q10-K10DS-K430TV-K10 Touch Screen LCD Display Assembly. DDR1 400MHz (PC1-3200). Our priority is to have the best price for you but without forgetting the quality ! DO NOT send without communication. WHO ARE WE ?. Capacity Per Module: 1GB. Low Density Full Tested. new arrival. We will try our best to replay in 24hours! Picture For Reference Purpose Only. If item is defective after 3 months, you can still send it back to us. We will send you a new one after receiving the defective item. We will try our best to reduce the risk of the custom duties. We will try our best to reduce the risk of the custom duties. If item is defective after 3 months, you can still send it back to us. We will send you a new one after receiving the defective item. 40GB 10x4GB DDR3 1333MHz DIMM KVR1333D3N9/4G SDRAM For Kingston. 16GB 4X4GB PC3-10600 DDR3 1333MHz CL9 240Pin DIMM KVR1333D3N9/4G SDRAM. We will try our best to solve any problems. Frequency: PC3200U 400MHz. i will help you soon. We take the weekend off. Before you order, make sure the RAM is compatible with your motherboard/CPU. Other Countries Depend on the item price. DDR1 400MHz (PC1-3200). 10GB(10x 1GB). QUICK LINKS. Non-ECC,Unbuffered. Logic Board. Pleasure deal with your purchasing from us. Hope you can understand. Picture For Reference Purpose Only. Other Countries Depend on the item price. OnePlus 1 . Compatible with Apple model: M9031LL/A M9032LL/A M9393LL/A M9455LL/A M9457LL/A M9748LL/A M9749LL/A. DDR1 400MHz (PC1-3200). 20GB(20x 1GB). We will provide a satisfied solution. Located In China. Hours Mon- Sat | 9.00 AM - 6.30 PM. Phone Display. Featured Products. Non-ECC,Unbuffered. DDR1 400MHz (PC1-3200). 1GB DDR2 667Mhz PC2-5300 240Pin Density DIMM Desktop SDRAM BT02 @@@@00002 @. 1GB DDR2 667Mhz PC2-5300 240Pin Density DIMM For Desktop SDRAM BT02 @@@@00001. 1GB DDR2 667Mhz PC2-5300 240Pin Density DIMM For Desktop SDRAM BT02. Capacity per Module: 1GB. Cache Latency: CL3. Capacity Per Module: 1GB. All Category. Pleasure deal with your purchasing from us. Hope you can understand. Other Countries Depend on the item price. Unknown item sent to us will be discarded. Low Density Full Tested. New Kingston 4GB DDR3 1600Mhz 240Pin DIMM SDRAM KVR16N11S8/4 Desktop PC3-12800UNew Kingston 4GB DDR3 1600Mhz 240Pin DIMM SDRAM KVR16N11S8/4 Desktop PC3-12800U. DDR3 1600MHz (PC3-12800). We’ll promptly reply you. 200pin DDR. ECC Server RAM. 2GB 240PIN DDR2. 260PIN DDR4. Non-ECC, Un-buffered. 200pin DDR2. Speed: DDR 400 MHz (PC3200). Type: 200-Pin DDR SO-DIMM. CPU Processor. for our request andwe hope you can understand ! So if you have any. We will response in 24 hours to resolve the problems. Manufacture by crucial ,hynix,micron,nanya or others. 184pin DDR1. 200pin DDR. ECC Server RAM. Hope you can understand. 260PIN DDR4. Non-ECC, Un-buffered. 200pin DDR2. Capacity Per Module: 1GB. All Category. Pleasure deal with your purchasing from us. Hope you can understand. Unknown item sent to us will be discarded. Low Density Full Tested. Tablet Parts. New Arrival. • 1GB PC3200 400MHZ Low-Density. Bus Speed PC3200 (DDR-400). Speed: PC3200 400MHz (AMD 333/266MHz compatible). Total Capacity 10GB. Form Factor DIMM. Buffering/Ecc Non ECC. Capacity per Module 1GB. Fit for Desktop. 184pin DDR1. 200pin DDR. ECC Server RAM. 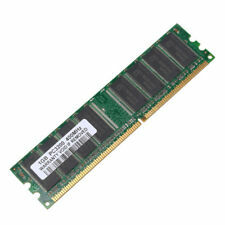 2GB 240PIN DDR2. 260PIN DDR4. Non-ECC, Un-buffered. 200pin DDR2. The Dram Module is made original ic. Computer Type: Server. We will try to respond as quickly as possible. PRODUCT BUS TYPE PC3200U. PIN COUNT 184-PIN DIMM. Logic Board. Pleasure deal with your purchasing from us. Hope you can understand. Picture For Reference Purpose Only. Unknown item sent to us will be discarded. Bike Chain Cleaning Brush Cycle Motorcycle Bicycle Gear Cleaner Tool Scrubber #3. Frequency: PC3200U 400MHz. Before you order, make sure the RAM is compatible with your motherboard/CPU. Orders will be processed instantly and dispatched in 24 hours normally, so we do NOT accept any requested note before or after you place orders. Bus Speed:PC3200 DDR1-400MHz. DDR3 16GB(2x8GB) Desktop 1600MHz PC3-12800 DIMM RAM For Kingston HyperX FURY. DDR3 8GB 16GB Desktop 1600MHz PC3-12800 DIMM RAM For Kingston HyperX FURY RL01. DDR4 4GB 8GB 16GB Desktop 2666MHz Desktop DIMM RAM For Kingston HyperX FURY R1US.